Since 1946, Tervis has been manufacturing the only premium, insulated drinkware that comes with an unconditional lifetime guarantee. These Crystal-clear Tervis Tumblers were created by engineering geniuses Frank Cotter and G. Howlett Davis, who combined the last three letters of their last names to create the now famous Tervis brand. Tervis Tumblers are made of top-quality, virgin polycarbonate, which gives them the clarity of glass, yet makes them virtually indestructible. Their unique, double-wall construction, combined with first-rate materials and Tervis’ high-tech ultrasonic sealing process, creates drinkware that literally keeps cold drinks colder and hot drinks hotter for longer. Additionally, condensation is virtually eliminated, so there are no rings left on furniture. Tervis Tumblers are so durable, they are dishwasher-, microwave-, and freezer-safe. A boxed set of two, 16 oz. 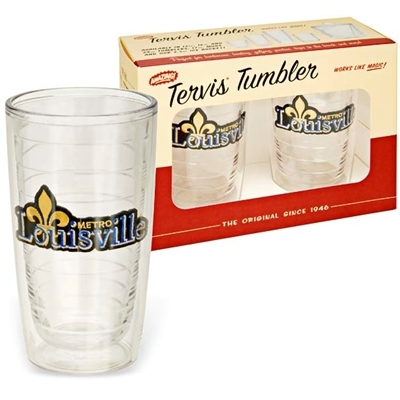 tumblers with an embroidered Louisville Metro Logo embedded in each.